Researchers encounter an amazing variety of script (or sometimes more like scratch!) amongst the handwritten documents produced in the eighteenth and nineteenth centuries. To become adept at interpreting historical cursive writing, readers must develop particular skills over time. The art of reading and analyzing historic handwriting and manuscripts is called palaeography. As instruction in cursive writing has become greatly diminished as part of school curriculums, help in reading historical documents is becoming increasingly important to make sure researchers are still able to use primary sources such as those housed in The Loyalist Collection. What materials were used in the document’s creation? Writing materials dictate the form writing takes; this comprises various surfaces for writing such as parchment, vellum, hand-made paper, and mass-produced paper. Writing utensils also shaped the form of writing and documents: lead (graphite) pencils, homemade and manufactured quills and ink, metal pen nibs (produced starting in the second half of the eighteenth century), or fountain pens (in use starting in the 1830s). Issues that may be encountered when dealing with original historical documents include ink blotches, fading, discoloured paper (foxing), tears and missing pieces, wrinkles and folds, and bleeding. Example of an ink blotch or spot. Grades and types of writing were associated with the purpose of the text and these types of styles are called hands. In describing hands, the aspect is the overall appearance of the script and the ductus is the speed at which the writing was done, number of strokes, and formation of letters. 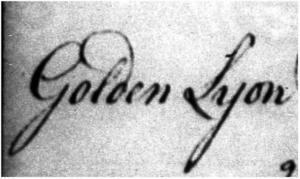 Round and copperplate were the most common hands for the period surrounding the American Revolution in North America. 1828 land petition of Thomas Blacklock, schoolmaster, in neat copperplate hand. If you are unclear on who wrote a document or want to know more about the writer’s life, you may be able to draw out hints through palaeography. 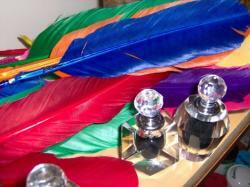 Like today, each writer has their own individual style and habits. Background reading in the subject area of the document will be of great help in both discovering the purpose, writer, and content of a document. 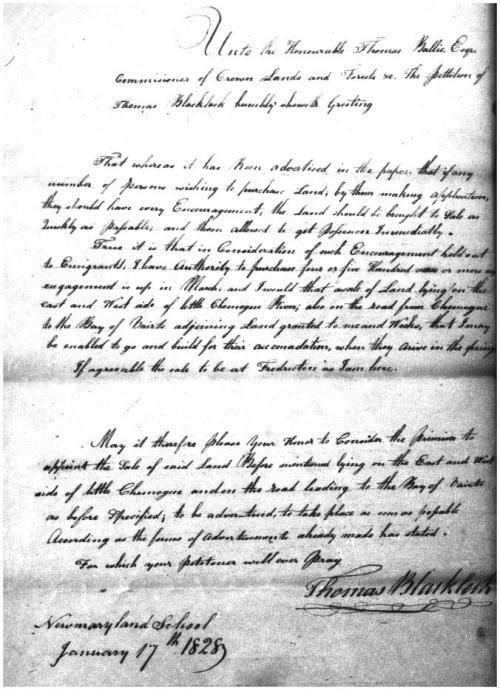 Long ascenders (on letters such as l, d, and h) and descenders (such as y, g, and f) show an individual’s style of writing on a Nova Scotia land petition. The location and time of the writing of a document is useful information if available, but analysis of the writing itself can give clues to its own creation as writing changes over time and place. Some particular quirks found frequently in eighteenth and nineteenth century documents from the Atlantic world include variations in punctuation from modern usage, as punctuation was only standardized through printing. Phonetic (words written as they sound) and archaic (not in modern use) spellings were common—remember that not everyone was fully literate and many spellings were not standardized. Doubling or singling of consonants from modern spellings also occurred, and upper case letters could be used for nouns in the middle of sentences. Archaic spelling of “lion” in a ship’s name. 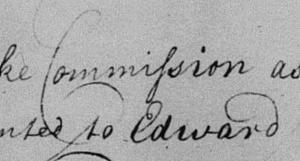 The long “ss” looks like “fs” in the word “commission” which was a common practice into the nineteenth century. Much can be gained from reading documents in their original form—emotion, circumstances surrounding creation of document, materials used, later additions and notations, edited content, and details of the document’s purpose may be gleaned, making the extra effort worthwhile. The following list will help those beginning in palaeography, or indeed may also aid the veteran transcriber. 15. Read aloud if you need to! 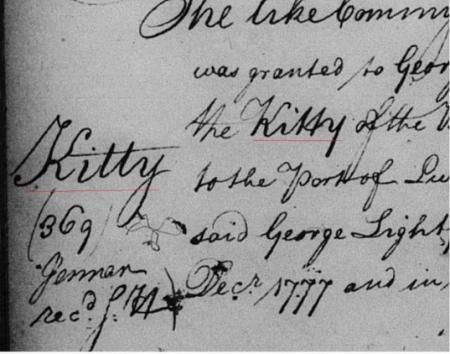 Using the “word matching” (#4) technique for the ship name “Kitty” on an application for a letter of marque. Thank you for this very informative blog entry. The explanations of the "common practices" and the handwriting examples were very useful. It is interesting to think about how hand writing has changed over the years and the various stylistic changes. The tips for dealing with historical writing are a great teaching tool!